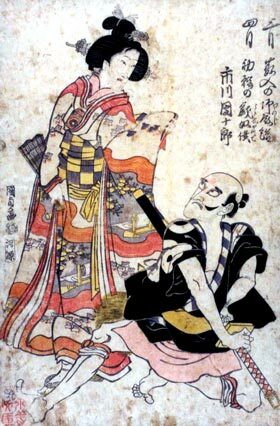 The actor Ichikawa Danjûrô VII performed in the 5th lunar month of 1814 at the Ichimuraza a 12-role hengemono, which was entitled "Manete Mimasu Shiki no Wazaogi", one role of each month of the year. One of these twelve roles, the role for the 4th month, a yakko, survived and became the dance "Tonbi Yakko". A yakko is sent out on an errand to buy the first bonito of the year for the household. On the way back to the mansion, the bonito is swiped by a kite (tonbi). The highlight of this dance are the cute gestures of the yakko as he goes after the bird in hopes of retrieving his fish.